Following Selena Gomez's claims Kendall Jenner in a relationship, sources close to the supermodel insist the rumours are not true. | HELLO! March 15, 2016 - 14:27 GMT hellomagazine.com After Selena Gomez claimed BFF Kendall Jenner is off the market, insiders close to the supermodel have insisted she and Harry Styles are not together. Earlier this week Selena Gomez was quizzed on Kendall Jenner's relationship status, and claimed her BFF had been taken off the market. But now sources close to Kim Kardashian's little sister have insisted the rumours are false. Kendall, 20, was recently linked to One Direction frontman Harry Styles, and the insider revealed that, while the romance is definitely over, there are no hard feelings between the former lovebirds. The source told E! News: "Kendall is single. She is not dating Harry anymore, but they are still friends and if they are in the same city they likely would [hang out]. Nothing bad happened between them, just busy schedules." When questioned about her Squad during a chat on Capital FM, 23-year-old Selena teased that she is the only single girl left. She said: "None of them are single, just so you know. Taylor [Swift] is not single, Gigi [Hadid] is not single, neither is Kendall. I'm the only single one!" 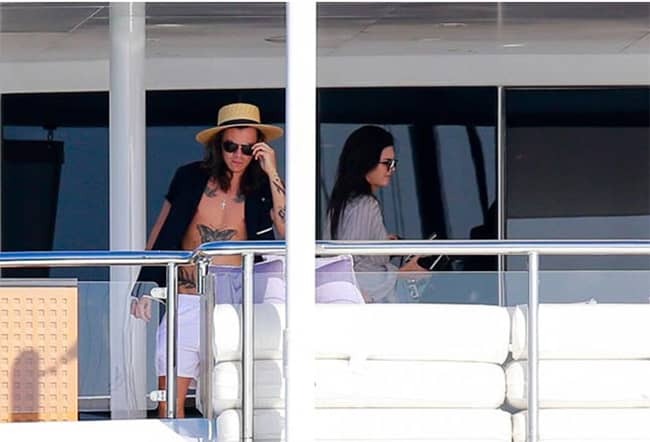 Rumours of a relationship between supermodel Kendall and Harry began in December last year, when they were snapped celebrating the New Year on a yacht in St. Barts. Kendall's sister Khloe Kardashian later confirmed the pair were more than friends, but was unsure of how serious they were. Speaking to Entertainment Tonight, 31-year-old Khloe explained: "I don't know if they're like boyfriend-girlfriend. Nowadays I don't know. People are weird with stuff. So, I don't know their title. But I mean, they were in St. Barts together hanging out, so that's dating." Addressing 22-year-old Harry's reputation as a ladies' man, an insider added: "Kendall doesn't want to get hurt, so she is proceeding with caution. She knows what the deal is." Meanwhile it's been reported singer Selena fears she'll be 'single forever' after splitting from pop superstar Justin Bieber. The couple allegedly split for good in February, after years of on/off dating.